The Racing Flag label is a must for any sailor. 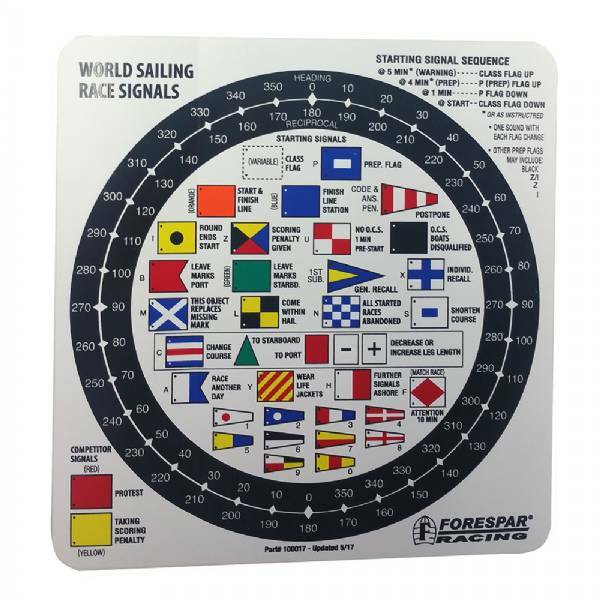 Code Flags used for regatta's are clearly listed and a compass rose with reciprocal courses is listed around the perimeter. These labels will be valid under international racing rules through December 31st, 2012. These popular label sets are great for any racer or cruiser. Add safety and organization to your above and below deck systems. Remember, not everyone on board knows your boat as well as you do. All labels are self-adhesive, vinyl plastic, waterproof and won’t fade. Perfect for flat, round or irregular surfaces of metal, fiberglass or paint. These popular label sets are great for any racer or cruiser. Add safety and organization to your above and below deck systems. Remember, not everyone on board knows your boat as well as you do. All labels are self-adhesive, vinyl plastic, waterproof and won’t fade. Perfect for flat, round or irregular surfaces of metal, fiberglass or paint.